Gloucester, 19 June 2017: Coldstore and composite panel specialist ISD Solutions continues its close relationship with lead contractor JJL Design and Build with the completion of a second cold storage facility for Kuehne + Nagel, the UK’s market leading logistics provider. Designed to provide additional capacity at Kuehne + Nagel’s Greenford site in north-west London, the £635,000 contract involved the construction of a new cold store building providing 3,860 sqm of floor space operating at a temperature of minus 25 degrees. associated areas. These included loading docks together with a cage storage area and a battery re-charge space for forklift trucks. In total, some 7,400 sqm of Kingspan KS1100CS panels were specified and installed to form the cold store, together with 3,860 sqm of floor insulation. Union Industries Eiger cold store traffic doors were also procured and installed as part of ISD’s package. 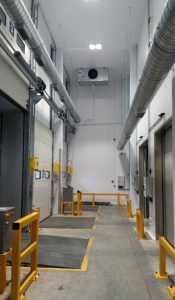 Nine bespoke cold store specification personnel doors, viewing windows plus all associated thresholds and powder coated galvanised trims used for the installation were designed and manufactured at ISD Solutions’ modern manufacturing facility in Gloucester. With a tight construction programme, speed was a key factor for the installation team. ISD was able to complete the main installation inside a five-week period, allowing the concrete floor to be poured a week before the Christmas 2016 shutdown so that it could cure over the holiday period. This enabled lead contractor JJL Design and Build to complete and handover the new fully operational cold store ahead of plan. Handed over to Kuehne + Nagel earlier this year, the project at Greenford follows a similar cold store installation for the logistics company at Reading in Berkshire.